Accountant verifies the data and drinks coffee. Workplace of secretary. Office secretary's working table. 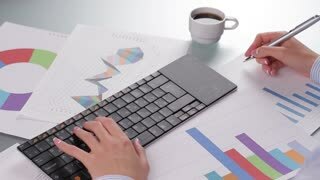 Businesswoman typing on wireless keyboard. Girl writes the result. Portrait happy smilling young woman in lingerie sitting in a black leather chair at table typing on her laptop in modern office. Young secretary working at ease in a free style. Happy smilling young woman in lingerie sitting in a black leather chair at table typing on her laptop in modern office. Young secretary working at ease in a free style. Portrait smilling young woman in lingerie sitting in a black leather chair at table typing on her laptop in modern office. Secretary working in office. Girl closes laptop and leaves the workplace.